Everyone is now familiar with sudoku, and will no doubt have played several puzzles. There are a large variety of variations on the sudoku theme on the market, which are more or less faithful to the original sudoku concept. This variation called ABCDoku adds a compelling extra element into the mix: no longer does a cell contain just one piece of information - the number - but each cell also contains a letter also. This means that there is twice as much information to keep track of and adds some interesting and compelling solving logic into the mix. This puzzle type is rarely seen in print, and in some places may be referred to as Greek-Latin sudoku because in mathematics a Graeco-Latin square (or a Euler square / orthogonal Latin square) is the description of an arrangement such as seen in this puzzle type. 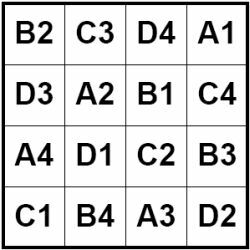 In a 4x4 puzzle like the example shown, the aim is to place the numbers from 1 - 4 once in each row and column, just like in sudoku. However, in addition, the letters from A - D must also be placed once in each row and column. As a familiar element, not only is each letter and number to appear once per row and column, but each combination of the two - such as A1 or D2 and so on - must appear once in the whole puzzle. In other words, if a cell contains D1 then no other cell in the puzzle may contain it, and if there is only one cell in a puzzle, conversely, that can contain D1, then it must be placed there, since each combination must occur once per puzzle. The picture on the right shows a sample filled grid. Because of the fact there are letters and numbers, and combinations of the two to consider, these puzzles work well in the smaller format of 4x4 or 5x5, though of course puzzles of any size can be created, apart from 2x2 and 6x6, because it is impossible to fill the grid in those cases. If you are interested in purchasing this fascinating and rarely seen variant of the sudoku logic puzzle, please do contact us with your requirements. Publishers - Please contact us to buy ABCDoku puzzles for publication in your book, magazine, newspaper, any other printed media or online.